Congenital Sucrase-Isomaltase Deficiency (CSID) is a rare genetic disorder, first discovered in 1960 by Weijers and colleagues,1 caused by pathogenic mutations in the sucrase-isomaltase gene (SI). 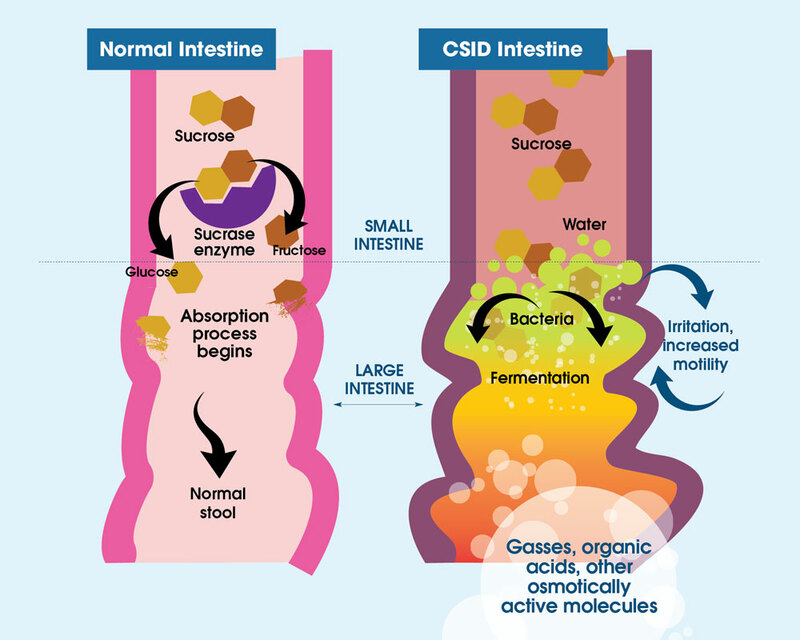 Animation: Sucrase Hydrolysis of Sucrose © The McGraw-Hill Companies, Inc.
What Are the Presenting Symptoms of CSID? Figure 3. 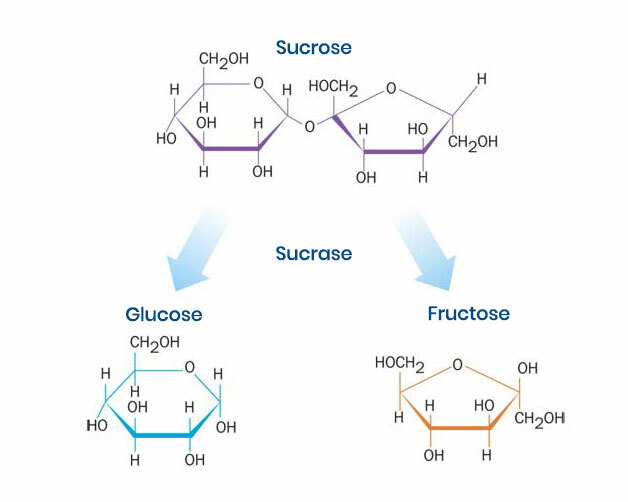 In individuals with normal digestion of sucrose, sucrose is metabolized by sucrase (purple) into two subunits, glucose (gold) and fructose (orange). With CSID, sucrase is absent or dysfunctional, and sucrose cannot be metabolized. Thus, sucrose is not absorbed by the small intestine and undergoes bacterial fermentation in the intestine. The fermentation byproducts are gases, organic acids, or other osmotically-active molecules, causing abdominal distention and pain, and water retention producing watery diarrhea. Weijers HA, van de Kamer JH, Mossel DA, Dicke WK. Diarrhoea caused by deficiency of sugar-splitting enzymes. Lancet. 1960;2(7145):296-297. Gray GM. Carbohydrate digestion and absorption. Role of the small intestine. N Engl J Med. 1975;292(23):1225-1230. Cohen SA. The clinical consequences of sucrase-isomaltase deficiency. Mol Cell Pediatr. 2016;3:5. doi: 10.1186/s40348-015-0028-0. Henström M, Diekmann L, Bonfiglio F, et al. 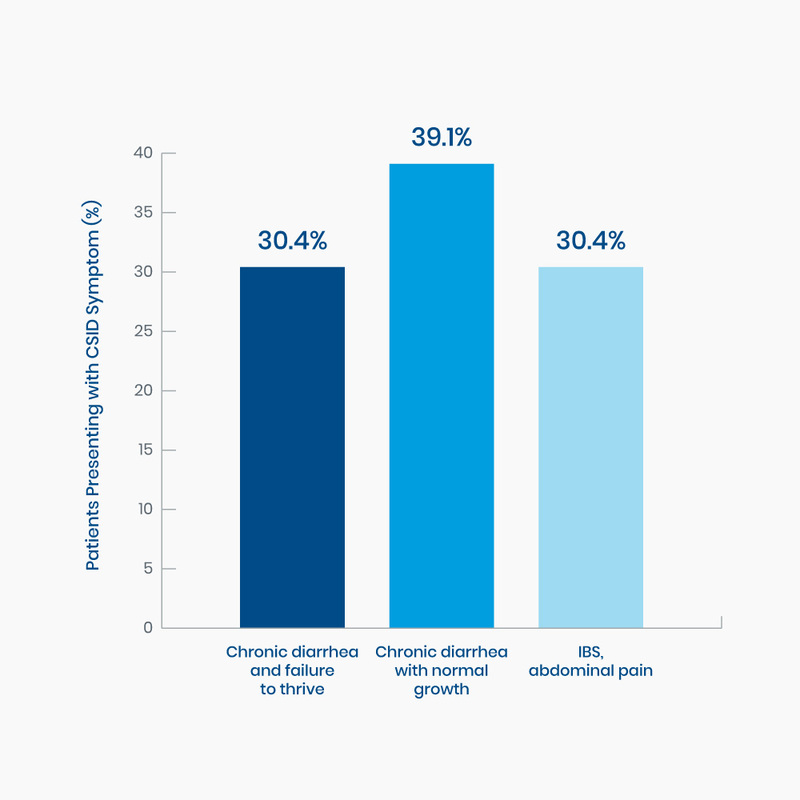 Functional variants in the sucrase-isomaltase gene associate with increased risk of irritable bowel syndrome. Gut. 2018;67(2):263-270. Naim HY, Sterchi EE, Lentze MJ. Biosynthesis of human sucrase-isomaltase complex. Differential O-glycosylation of the sucrase subunit correlates with its position with the enzyme complex. J Biol Chem. 1988;263(15):7242-7253. Hauri HP, Quaroni A, Isselbacher KJ. Biogenesis of intestinal plasma membrane: posttranslational route and cleavage of sucrase-isomaltase. Proc Natl Acad Sci USA. 1979;76(10):5183-5186.